Starring Will Smith and his real-life son, Jaden Smith. This movie is based on the story of Chris Gardner and the trials and tribulations that he endured on his way towards becoming a multi-millionaire. 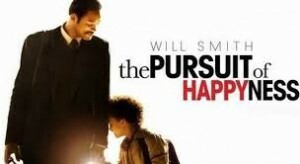 “The Pursuit of Happyness” focuses on the period of Gardner’s life when he was attempting to become a top trainee in Dean Witter Reynolds’ stock brokerage training program. Gardner and his son were homeless at the time, as the money that Gardner received through the stock brokerage training program wasn’t enough for them to live on. Gardner and his son moved from homeless shelter to homeless shelter, all while Gardner was attempting to gain employment at Dean Witter Reynolds. Inside Job won an Academy Award for “Best Documentary – Feature”. 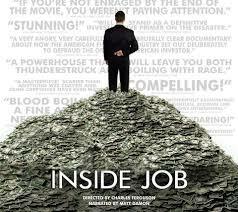 Narrated by Matt Damon, “Inside Job” provides a “comprehensive analysis” of the 2008 global financial crisis. The film attempts to answer the question – how did the global economy get to the point of very nearly collapsing, and who was responsible? This film will almost certainly make you extremely angry about the current state of the world. Starring Dan Aykroyd and Eddie Murphy. A common criminal (Eddie Murphy) and a millionaire (Dan Aykroyd) switch places as part of a bet that is hatched by two wealthy commodity brokers. Can Eddie Murphy be molded into a successful businessmen despite his lack of experience and education? Can Aykroyd handle having his previously successful life taken away from him? 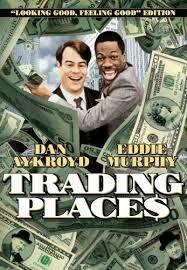 “Trading Places” is a hilarious comedy that benefits from a biting and well-written script. “Boiler Room” examines what it might be like to work in a “chop shop” or “boiler room”, where con artists unload worthless stocks onto unsuspecting investors. How does a person end up working at a “chop shop”? How much money is there to be made? 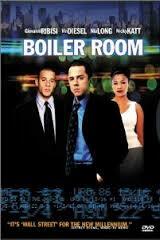 What is the culture like insider of a “boiler room”? What type of person is being swindled out of their money by these “boiler room” operators? This movie contains a number of big names, including the likes of Ben Affleck, Vin Diesel and Giovanni Ribisi. This is the gold standard of stock market movies. 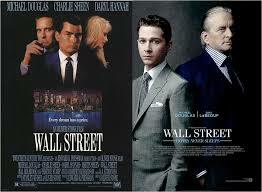 “Wall Street” stars Michael Douglas and a pre-“winning” Charlie Sheen. Michael Douglas’ portrayal of “Gordon Gekko” was so good that he ended up winning the Academy Award for best Actor in 1987. “Wall Street” spawned many memorable quotables, including the most famous line of all – “Greed is good”.